It's a four leafed clover popping pills. Duh. Short update on an issue you may have heard this morning. 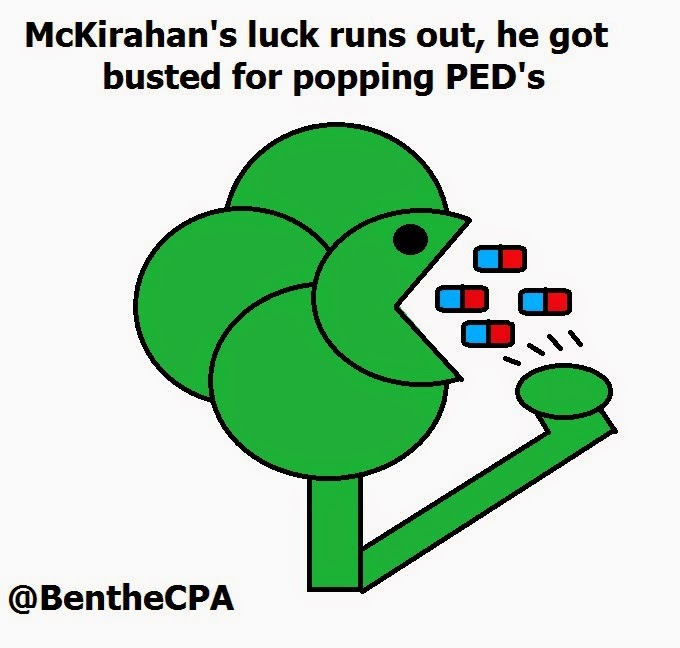 Andrew McKirahan, in a move that disgraces Irish-descendant people like myself everywhere, got suspended for using PEDs. Apparently, he's one of the first active Braves players to ever get busted for this, so thanks for nothing you jerk-face. The really crappy part of this is that McKirahan is a lefty reliever, and those aren't exactly growing on trees down at the local Reliever Supply Store. Normally, we'd just call somebody up out of AAA Gwinett, but the problem is we aren't really flush with major left-handed talent. Our options are Ian Thomas, Brady Feigl, Donny Veal, and Manny Banuelos as the LH's down on the farm. Here's the issue. Ian Thomas has seen about 16 games in the show last year, and he wasn't all that impressive with a 4.22 ERA, a 1.50 WHIP, and he was responsible for two losses. His K/9 rate (that's strikeouts per nine innings) is really robust, but he also will walk some folks and give up hits. My concern over him is his WHIP, which you can't have as a reliever. Too many baserunners are a deathknell for any reliever, because teams will grind on you late in games. So while he's an option, I'm not in love with it. Manny Banuelos has been starting games down in Gwinnett, so I'm not sure they would want to bring him up right now as a reliever, especially since the back end of the rotation is suspect. We might need him later on. Feigl has been on the DL until recently, so there's no way he's ready yet. Donnie Veal is an interesting option as he's a journeyman 30 year old reliever by way of the White Sox, but he got rocked in 2014 and hasn't been called up since. I'd be more likely to give him a shot given his experience than Ian, simply because Ian proved he wasn't ready last season, or given many chances in spring. The truth is that the Braves would love to have other options outside of the organization, because all the lower level options aren't great. My guess is they will be stuck with what they have, since almost nobody trades pitchers this early in the season. I would expect Ian Thomas or Donnie Veal to get the nod. We'll just have to see which one the Braves pick.